The approaching Anzac Centenary has been the impetus for us to research the collection and identify interesting items for students, teachers, armchair historians and anyone interested in Queensland history. In this post we are looking at records that specifically refer to the early days of the Gallipoli campaign. The Dardanelles is the name of the main sea lane through which troops were transported to the Gallipoli peninsula, Turkey in 1915 and 1916. The British wanted access through this sea lane to transport supplies to their Russian allies so they began bombing Turkish defences on 19 February 1915. When this failed it was decided to invade the Gallipoli peninsula. The Mediterranean Expeditionary Force, comprising British, Australian, New Zealand, Indian and French soldiers was assembled in Egypt and on Greek Islands. As dawn was breaking on 25 April 1915, the combined Australian and New Zealand force (ANZAC) landed at Gallipoli near Gaba Tepe. The 9th battalion, mainly comprising Queenslanders, was one of the four Australian battalions that carried out the ‘Landing’. 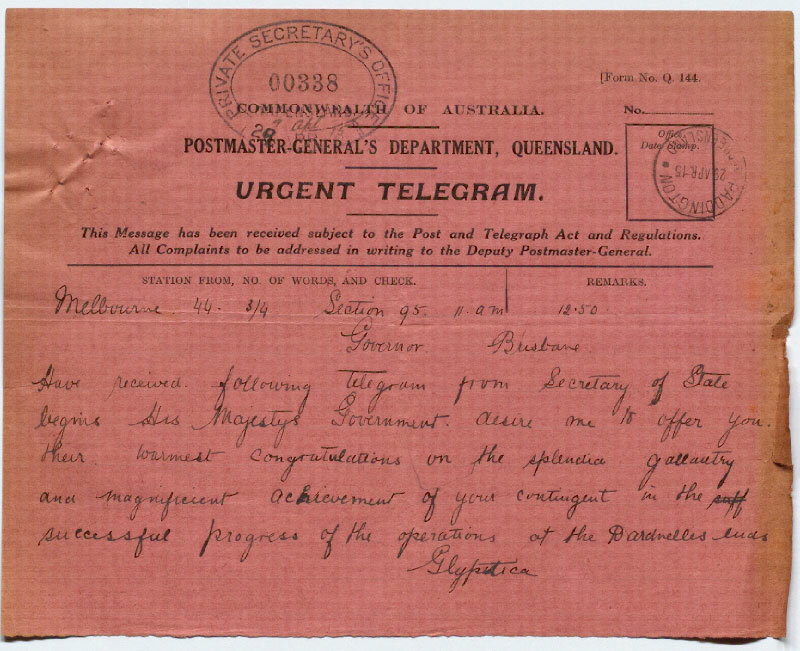 This telegram dated 29 April 1915 from the Governor-General of Australia to the Governor of Queensland praises the achievement of the contingent and the gallantry of the men in the Dardanelles. A month later, this letter from the Department of Public Instruction was sent to all teachers asking that they read to their pupils a British war correspondent’s account of the first landing of Australian soldiers at the Dardanelles on 25 April 1915. Ellis Ashmead-Bartlett writings as a war correspondent were instrumental in establishing the Anzac legend. His account of the landing was published in the June 1915 edition of the Education Gazette. Teachers were advised to add explanations of the text and comments that may be necessary to “impress upon the intelligence and sentiments of their pupils the grandeur and gravity of the historic incident”. For more information on the emergence of Anzac Day, see the essay by historian Mark Cryle, ‘Holy Day or Holiday: On the Origins of Anzac Day in Queensland’. The State Library of NSW as they hold the Ellis Ashmead Bartlett papers 1915 – 1917.